For example, the new Touch Compass work, Somatechnics, was livestreamed to a global audience of 2000. Last year, it was also performed 11 times in early December to lunchtime audiences in Auckland’s Aotea Square. Two of the company’s founding members, Lusi Faiva and Rodney Bell, featured in Somatechnics, one of the 2017 projects featured under the InMotion umbrella. The other dancers were Alisha McLennan Marler, Julie Van Renen and Duncan Armstrong. Starting from the top of the wide steps and handrails up to the Aotea Centre, dancers moved down to the square and performed using different modes of transport. 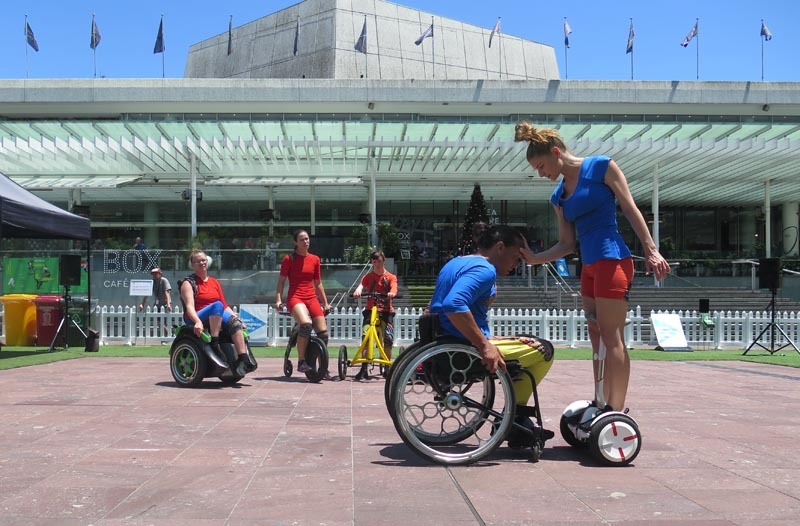 Wheelchairs, a YikeBike, an Ogo, an Alinker walking bike and a mini Segway became graceful tools directed by their dancers. 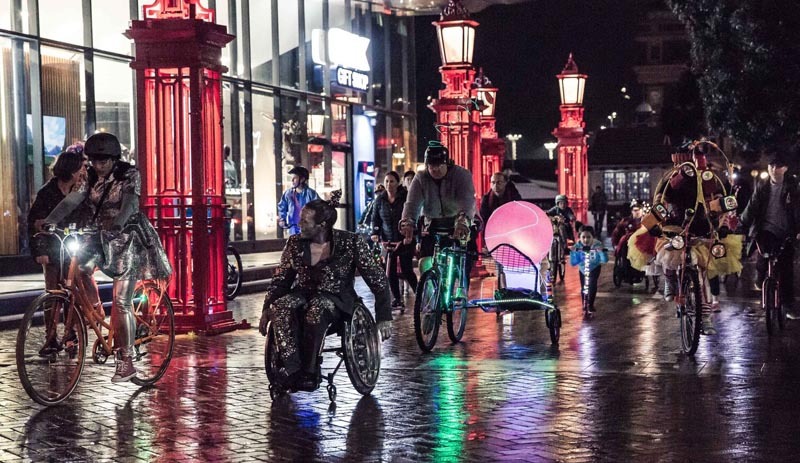 Another project highlighting new modes of transport was InMotion Matariki, Auckland's first illuminated all-wheels parade for people on bikes, wheelchairs, mobility scooters, skateboards and so on. Held in June during Matariki, the parade included pop-up performances en route from The Cloud to Silo Park via the Wynyard Quarter. Since 1997, Touch Compass has been challenging people’s ideas of what dance is and who can do it. 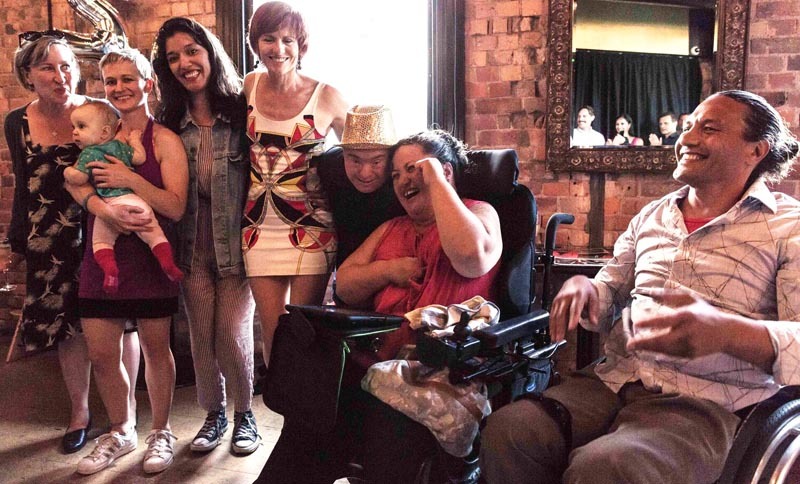 Described as New Zealand’s “only professional inclusive dance company”, it is made up of disabled and non-disabled dancers “dancing towards an accessible society in which the creative talents of all members can be fully realised”. Catherine says there’s still so much more the company can achieve. “There’s a huge gap in people’s awareness of what’s possible and what people with disabilities or difference can achieve. Money continues to be a challenge despite being grateful to Creative New Zealand for the annual funding it receives through the Toi Uru Kahikatea (Arts Development) Investment Programme. She’s proud of all the connections and career pathways Touch Compass has provided over the years but hopes that one day, the company won’t need to be described as an “inclusive” dance company. Touch Compass Dance Trust is a member of the Arts For All Auckland Network, facilitated by Arts Access Aotearoa. If you would like to become a member, please contact Claire Noble (T: 04 802 4349 E: claire.noble@artsaccess.org.nz). Original generation time 1.6769 seconds. Cache Loaded in: 0.0375 seconds.